East Meets Cajun - Adzuki Bean Gumbo & Millet Maitake Jambalaya | We Like to Cook! We have taken on another Marx Foods Challenge; East Meets Delicious. Several weeks ago we received a goodie box in the mail which contained Adzuki Beans, Dried Maitake Mushrooms, Mochi Rice, Organic Millet, Hijiki (a variety of seaweed), and Dried Star Fruit. Our assignment was to create TWO original recipes using at least four of the ingredients. But unlike challenges of the past, this one has an added task: we would have to create one recipe for an appetizer and the second for a main course. The first step was to decide what type of meal to make. The choices were not as obvious as one might suppose since three of the six ingredients (i.e. Adzuki beans, Mochi rice and dried star fruit) are used to make traditional Chinese and Japanese desserts. With Mardi Gras (Fat Tuesday) only a few days away, we decided to try some dishes with a Cajun flair beginning with a red bean gumbo as the starter and culminating with a variation on jambalaya using millet and Maitake mushrooms. We were worried that these mild Asian ingredients would not hold up to the bold flavors and spices typical of Cajun cuisine, but we were pleasantly surprised with the results. We think you will be too! Generally speaking, gumbos are soups that begin with a base of roux (which is browned flour in an oil base) and Cajun mirepoix*. In gumbo, roux can be used alone or in conjunction with either of the other thickeners such as okra or file powder (made from the dried and ground leaves of the sassafras tree). Soak the Adzuki beans overnight and cook until tender. Drain and set aside. Heat the oil in large heavy pot over medium heat, then stir in the flour to make a dark roux. Stir the roux constantly to prevent burning; until the color has changed from white, to beige, and finally to dark brown. When it is ready, it should smell great, like roasted nuts. If it smells burnt, you went too far. A truly dark roux can take up to 30 minutes, so patience is the key. Once the roux is browned to your liking, add the onions, bell pepper, and celery and cook until the onions are clear. Slowly add 1 cup of the stock stirring well to form a thick paste then add the remainder of the stock. Stir in the Worcestershire and garlic then the sausage and wine. Next stir in prepared Adzuki beans and okra, and then add salt and hot sauce to taste. Cover and reduce the heat to low and allow to simmer at least 45 minutes ( up to 2 hours) stirring frequently and adding water or broth if the gumbo gets too thick. Meanwhile, cook the rice. Mochi rice is very glutinous so begin by rinsing the rice thoroughly to remove extra starch. Bring 1 ½ cups of water to a boil and add the rinsed rice to the boiling water with a pinch of salt. Bring back to a boil and then reduce the heat to low and simmer for 10 minutes. Turn off heat but do not remove lid and allow rice to steam for an additional 10-15 minutes. This one-pan meal is simple to prepare and packed with flavor and nutrition. Traditional jambalaya is made in three steps: the meat is browned, vegetables are cooked until soft, and the dish is completed by adding stock and rice. It is a close cousin to the saffron-infused paella found in Spanish culture. Rehydrate dried Maitake mushrooms by placing them in a cup of boiling water and allowing them to sit until the water is cool. Strain the mushrooms and reserve the water to use as broth. Heat a tablespoon of the oil in a large, deep skillet over medium-high heat. Season chicken with a smattering of Cajun spices, then arrange the chicken breasts in the skillet. Cook, flipping once, until deep golden brown all over, about 10 minutes total. Transfer chicken to a large plate and set aside. With all of the breasts browned and resting, add remaining tablespoon of olive oil, onions, chopped reconstituted Maitake mushrooms and millet to the same skillet, and cook, stirring often, for about 5 minutes. Add garlic and Cajun spices and cook for about one minute more. Stir in white wine and broth and mix together until well combined. 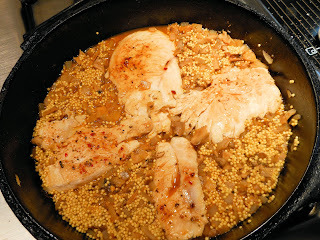 Place the chicken breasts back into skillet, nestling them in the millet mixture. Bring the whole dish back to a boil. Then cover, reducing heat to medium-low, and cook until the chicken is cooked thoroughly and millet is tender (not crunchy), about 25-30 minutes. Spoon chicken and millet onto plates and serve with your favorite hot sauce, preferably with good Cajun music playing in the background! And, try our homemade King Cake for dessert! Remember if you find the baby, you must bring the next King cake!! *Mirepoix (also known as “Holy Trinity”) is the classic French combination of onions, celery and carrots, and in a ratio of 2 parts onions, 1 part celery and 1 part carrots, and is used in making stocks, soups, sauces, and stews. Cajun Mirepoix or Cajun Trinity (onions, celery and bell pepper in equal amounts) is the Cajun equivalent and is used in classic Cajun “receipts” such as gumbo, jambalaya, and étouffée. Funny timing ... you answered a question I hadn't asked yet LOL. I made a Chicken Etouffee tonight and read somewhere that it's the same as a gumbo but knew that wasn't right. For one thing, gumbo is more of a soup. I was thinking the difference may just be a thicker sauce and file powder but wasn't sure what was in the file. Voila! You just answered that. Reading my mind again huh??? I've been really looking over all the entries carefully to the Marx Challenge, and what I love about yours is how it really seems like East MET West. Great job on making an awesome fusion! Nice! Gumbo was a great idea, considering the ingredients we got. Perfect! This is such a unique way to utilized the ingredients! I love the way you fusion Asian ingredients into the cajun dishes. Very festive for the Fat Tuesday. this gumbo is really healthy adzuki beans is good source of magnesium, potassium, iron, zinc copper, manganese and B vitamins.